We had a wonderful morning starting with a good walk to mass at St. Stanislaw on the Rock built on the site where the king killed the good bishop in 1079. He is now the patron of Poland. What an amazing thing to celebrate Mass in a church where a bishop was martyred over a thousand years ago. It is exhilarating to breath Catholic air in Poland! Then to the “Perfect Communist City” which under Stalin was intended to be godless and churchless. However, the 250,000 Poles erected a cross in a field and came to pray. 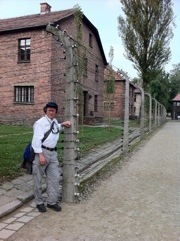 The Communists bulldozed it every week but the Poles defiantly replaced it. Eventually, with the help of Archbishop Karol Wajtila (later JPII), they received permission to build a church which they defiantly build with their own money and hands under the disapproving eye of the regime. 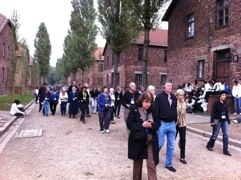 Stay tuned for Part 2 where we visit Auschwitz and Birkenau. Unbelievable! I was here 25 years ago during Soviet Communism. Hit’s me more today. More soon. Devin Rose is a software engineer and former Atheist. This is his story from Atheist to Baptist to Catholic. I believe and profess all that the Holy Catholic Church teaches and proclaims to be revealed by God. But it was not always so. I grew up secularly. My mother was brought up in a particularly legalistic branch of the churches of Christ denomination, and my father, in the Episcopal Church. But the only church I remember going to as a child was a Unitarian Universalist one, and we went there for just a short time. The sole Unitarian sermon I recall having to sit through included a joke about (then Vice President) Dan Quayle that got big laughs from the congregation. I was taught at home and at school that humans evolved without purpose from primordial ooze, so unsurprisingly, when I became old enough to reason about such things, I proudly declared that I did not believe in God. In high school, I came to base the perception of my own worth as a person on what others thought of me. It was an unstable foundation to be sure, but so long as everyone thought well of me and I had nothing to be humiliated about, all was well. Eventually however, this way of thinking caught up with me, and I reached a point where I could not hide any longer from it. That point came during my sophomore year in college. On the outside, my life was really great: I made good grades in school and had a nice girlfriend, a family who loved me, and lots of friends. But on the inside, I was beginning to be eaten alive by anxiety. It started out small and slowly got worse. I began getting nervous in social situations like going to restaurants, to the movies, and eventually, just being in class for school. My stomach would churn, and I would fear having to run out of the classroom, embarrassing myself in front of everyone. For the whole story click here.